Despite the recent snow, it is officially spring, which brings not only warmer weather (hopefully), but also plenty of events. Please check out the MI Happenings section for details on how to march with us at Lexington’s annual Patriots' Day parade on April 16th and see the Upcoming Events section to learn how to join us at Lobby Days at the State House tomorrow April 4th or attend a gubernatorial candidate forum or two important gun violence prevention events this weekend. This week’s issue also has details on our team meetings taking place next week and information on the upcoming March for Science on Saturday, April 14th. 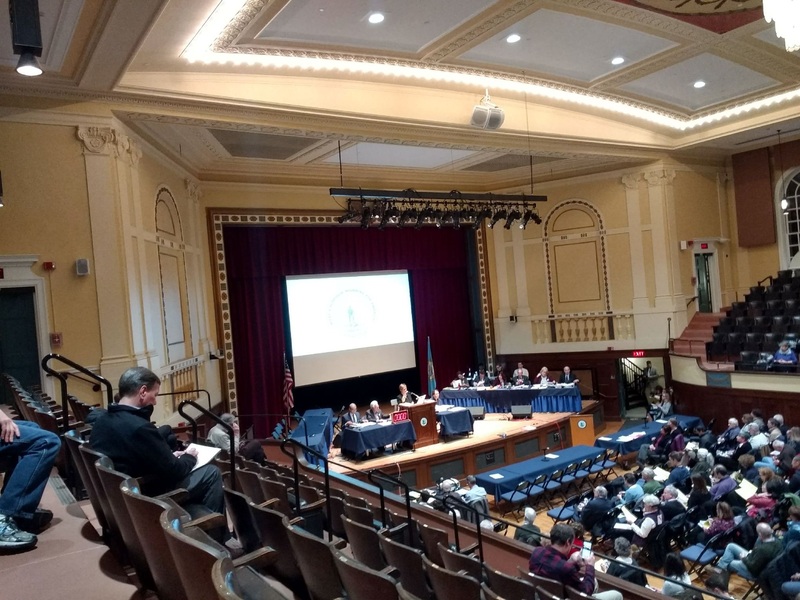 Spring is also Town Meeting season in Massachusetts and several local towns are debating articles that MI teams are working on; this week’s Spotlight section focuses on this important New England tradition and highlights ways our members can participate. 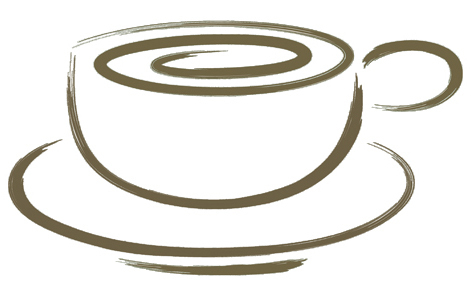 Spring also brings a big push to get legislation passed at the State House before the legislative session ends - see the Morning Coffee Actions section for ways you can help advance several important bills by making just a few quick phone calls. Many Indivisible groups, including us, rely on Facebook to network and share information. If you’re alarmed by the recent revelations that Cambridge Analytica obtained Facebook data without users knowledge and may have used it to influence elections, the Morning Coffee Action section outlines a way to let Facebook know how you feel and the Recommended Reading section describes ways to protect your own Facebook data. Sign up to join us at a phonebank/postcarding party on Thursday April 12th from 7-9pm at an election team leader's house in Reading, MA (we'll email you the address when you RSVP using this link). We'll be calling like-minded Democrats in PA-06 to introduce Chrissy Houlahan and enlist volunteers for her campaign and be sending postcards to voters in NJ11 in support of Mikie Sherrill. Feel free to join for the full 2 hours or any other amount of time you are available. Mass Power Forward is a strong coalition of dozens of environmental groups that is trying to get the Senate Omnibus Climate Bill (S.2302) and other environmental legislation passed in Massachusetts. 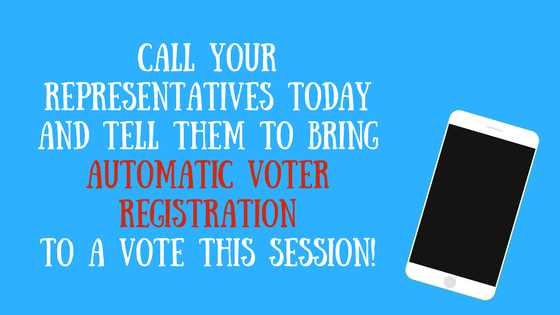 Please call your state legislators and ask them to urge their leadership to bring S.3203 up for a vote. See this fact sheet for more information on the many issues the bill covers, including provisions on climate policy, renewable energy, and transportation, and this link for a sample call script. Mass Power Forward is encouraging constituents to call on Mondays for greater effect, but calls are welcome anytime! 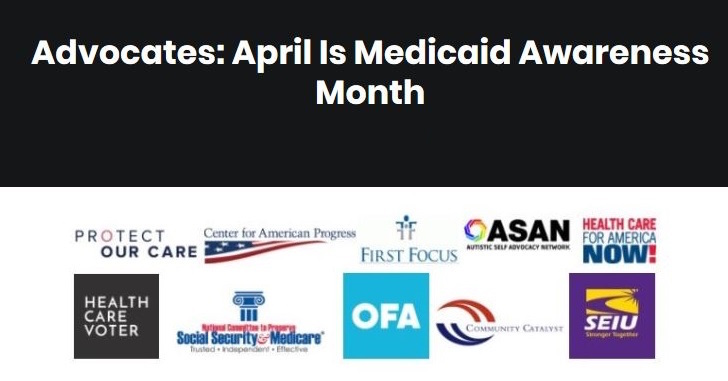 A coalition of health care advocacy groups will observe Medicaid Awareness Month this April, conducting educational campaigns focused on a different topic each week, culminating in a national Medicaid Day of Action on April 30. Medicaid is a jointly funded, Federal-State health insurance program for low-income and other people, including children, the aged, and/or those who are blind or otherwise disabled. Contact our MoCs to thank them for their past support of Medicaid, ask them what they're planning for Medicaid Month, and urge them to do all they can to defend this vital program. Elections Team member Judy Lubershane encourages us all to send postcards to Mark Zuckerberg at Facebook with the following text: "Mark, Due to your carelessness, you've built up quite a debt to America. Work to redeem yourself! Run a non-partisan public service post/advertisement to remind Facebook users across America to 1) Register to vote! 2) Vote in local, state, and national elections." Send postcards to: Mark Zuckerberg, Facebook, 1601 Willow Road, Menlo Park, CA 94025. Share this idea with your friends and networks - let's make sure Mark hears us! MA Secretary of State William Galvin recently announced his support for the Automatic Voter Registration (AVR) bill moving through the Massachusetts legislature. A few weeks ago, the bill was voted favorably out of the Elections Law committee, got a new bill number (H.4320), and is now before the House Committee on Ways and Means. In the previous legislative session, the bill didn't make it out of this committee, so we need your continued efforts to get it passed in the legislature and on to the Governor's desk. Several other states, including WA, OR, CA, and RI, have passed AVR legislation and many other states are considering it. Please call Secretary Galvin at 1-800-392-6090 to thank him for his support and contact your state representative to urge them to help this legislation get passed. See this link for more information and sample scripts. Worried about Trump trying to fire Mueller or impede his investigation? If you've already signed up for the Mueller Rapid Response rallies and asked our MoCs to co-sponsor existing bipartisan bills to protect Mueller's investigation (S. 1735, S. 1741, and H.R. 3771), you can use MoveOn's text tool to call progressive voters in states with GOP MoCs and ask them to make calls urging support for these bills. To get started, visit this page, which has all the information you need, including a short training video. For more details and scripts for calling members of Congress, see this Google doc. We had so much fun marching in Lexington's Patriots' Day parade last year, we've made plans to do it again and hope that you'll join us! The parade steps off on Monday, April 16th at 2:00 pm from the intersection of Massachusetts Avenue and Maple St. and proceeds almost two miles down Massachusetts Avenue through Lexington Center to Worthen Road. You can march the entire route, join us at some point along the way, or cheer us along from your favorite viewing spot. The parade, which caps off three days of events, also features marching bands, fife and drum companies, floats assembled by local organizations, Clydesdale horses, and the entire Aleppo Shriners marching contingent including clowns, mini-trucks, and a brass band. You can use this link to let us know you plan to join us, then grab your tricorn hat (or favorite red, white, and blue outfit), put on some comfy shoes, and get ready to march! 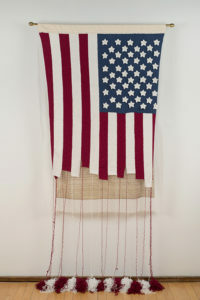 At last week's Democracy Team meeting, Adrienne Sloane, a local fabric artist, gave us a short presentation on craftivism and showed us some samples of her work, including the piece displayed in the first photo below, Message to America: Mexico 2018, a flag with thoughts that Mexicans wanted to share with the US after Trump's election. She also described Cast (on) Your Vote, a new project that anyone who knits or crochets can participate in - see this link for details. A generous member purchased 500 postcards illustrated with The Unravelling, the piece shown in the second photo which is currently on display at the Fuller Craft Museum, and donated them to MI for use in contacting our MoCs. Last week, the Arlington Democratic Town Committee's Issues Subcommittee held an excellent forum on elections and voting rights. 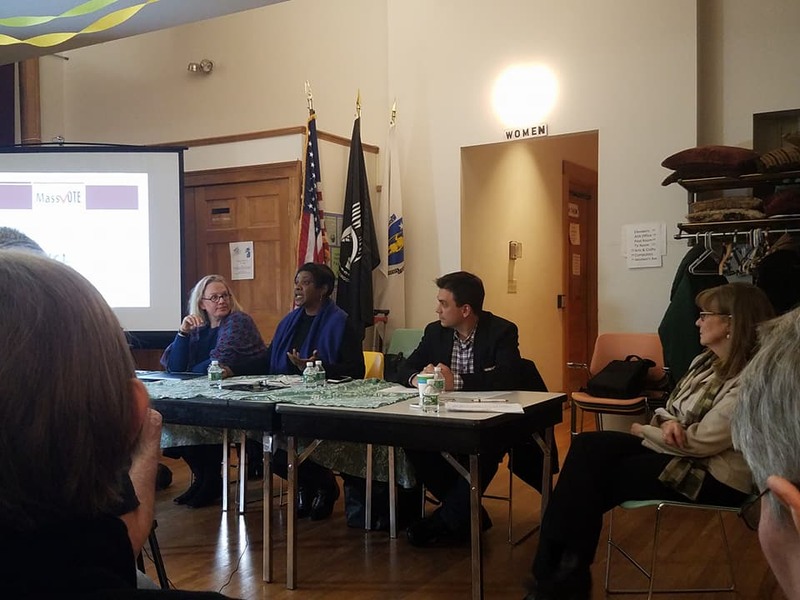 Greg Dennis of Voter Choice discussed ranked choice voting, Joyce Hackett from Lift Every Vote urged the audience to push for automatic voter legislation, and Cheryl Clyburn Crawford from explained MassVote's many programs and initiatives. Several state legislators and one of the Democratic candidates for Lt. Governor were in attendance and the audience had the opportunity to ask questions of the panelists and speak to them individually after the program ended. MI was proud to be one of many organizations helping to publicize this event. While some of our members live in cities, most live in towns where they can participate in one of the oldest traditions in our democracy, Town Meeting. This excellent guide from the Massachusetts Secretary of State explains what town meeting is, how it works, and how it varies across different communities in the state. Lexington, Arlington, and Billerica have “Representative Town Meetings,” where only elected representatives can vote on the issues presented at town meeting; other communities, such as Bedford, Lincoln, and Weston, have “Open Town Meetings,” where any town voter present at the meeting are allowed to vote on all issues. 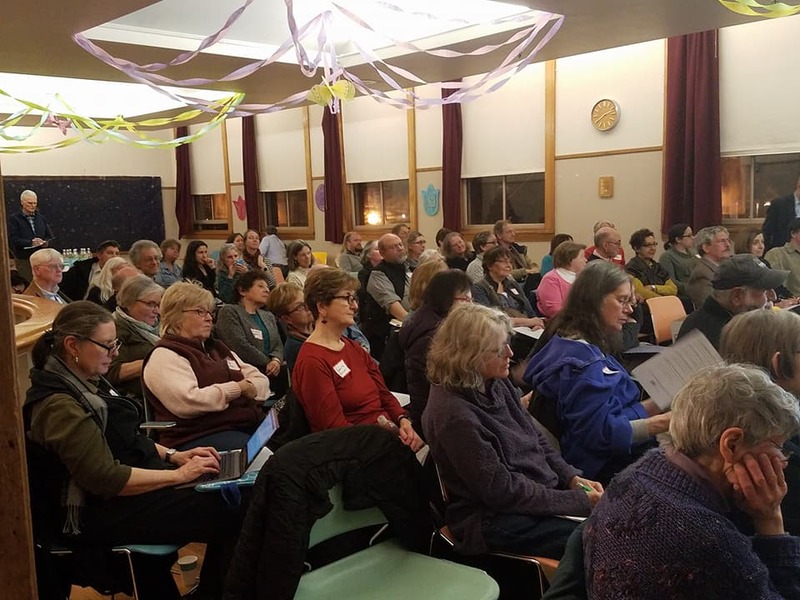 While Minuteman Indivisible typically focuses on federal or state legislation, regulation, and elections, important actions to resist the Trump agenda can also take place in our local communities. Last year, several local communities, including Arlington and Concord, passed Sanctuary or Welcoming Community resolutions and others, including Brookline and Weston, passed resolutions calling for the impeachment of President Trump. This spring, Lincoln just passed a “Safe and Welcoming Communities” resolution and similar proposals will be voted on by Lexington as early as this Wednesday, April 4th and by Sudbury in May. Many MI members already participate in their local town meetings and we encourage everyone to explore the options for getting more involved. 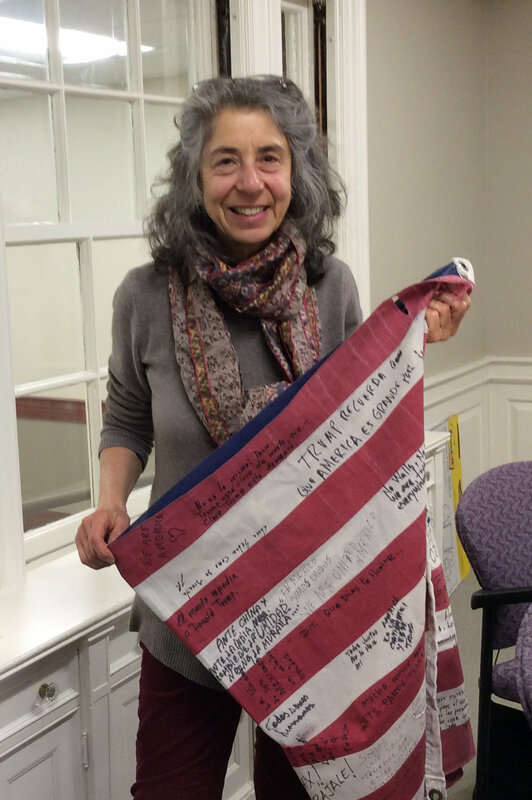 Possibilities include voting in open town meetings, running to become a town meeting member in towns with representative town meeting (one of our members was recently elected with only 2 write-in votes! 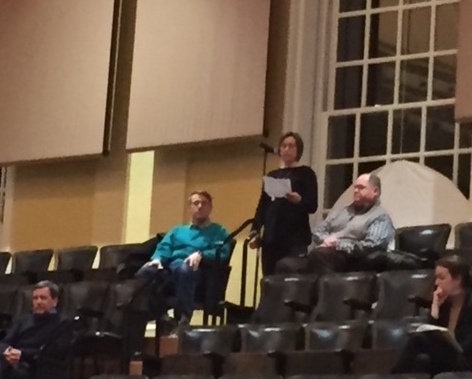 ), speaking as a citizen on an issue before town meeting (as one of our members did last week to voice our Climate & Environment team's support of the plastic bag ban at Lexington’s town meeting), or working to get a “citizens" article voted on at town meeting (MI members were actively involved in getting the Safe and Welcoming Communities resolutions placed before the Lincoln and Lexington town meetings and the Impeachment resolution in Brookline). Town meeting is one of the best ways to understand what “government of the people, by the people, for the people” really means and to get first-hand experience in making laws, running for election, and lobbying on issues. While some towns have already held their annual town meetings this year, many others are still ongoing or yet to start. Check your town website for the dates of your town meeting and the list of issues being debated (the "warrant") and get involved! 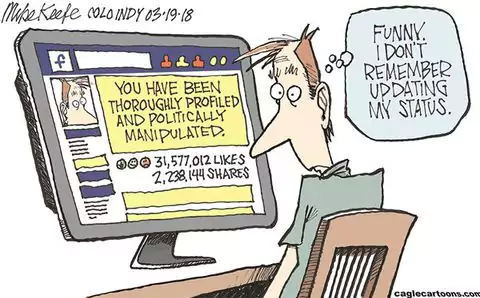 Are you concerned about recent reports that companies were able to exploit Facebook users data to influence elections without users permission? Our fellow Indivisibles at Rise Up Western Massachusetts have compiled this list of articles to help us protect our Facebook data. Join us and other Indivisible groups at the Massachusetts State House next week! 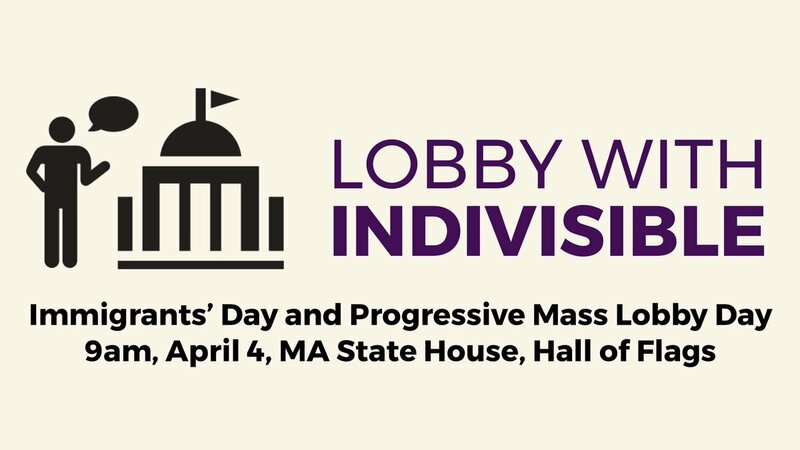 Two established organizations — the Massachusetts Immigrant and Refugee Advocacy Coalition (MIRA) and Progressive Massachusetts — are holding “lobby days,” when you can learn about cutting-edge political initiatives and visit your own representatives, armed with information and allies. For more information and to RSVP for the Progressive Mass Lobby Day, click here. For details and to RSVP for the Immigrants' Lobby Day, click here. This event will feature individual, hour-long interviews with each of the three gubernatorial candidates (Jay Gonzalez, Bob Massie, and Setti Warren) conducted by a panel of four PDM members and allies. After hearing from all three candidates, there will be discussions among the attendees over lunch (provided by the venue). The forum will conclude with a straw poll of those in attendance, for the governor's race, as well as for the lieutenant governor's and secretary of state's primaries. RSVP using this link. In conjunction with March for Our Lives, students are organizing town halls across the country to engage with their MoCs on the issue of gun violence prevention. 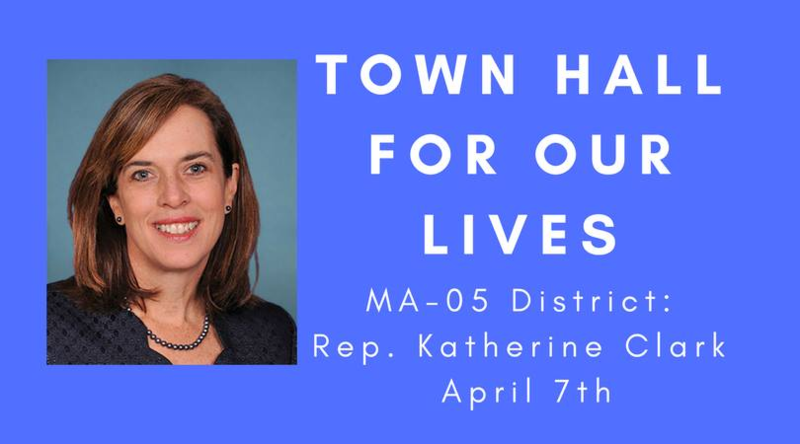 Rep. Katherine Clark will be attending this town hall being organized for MA Congressional District 5. See this link for more details. Attorney General Maura Healey and Louis D Brown Peace Institute President Tina Chéry, along with a high school activist and a former teacher, will be speaking at this free forum to discuss gun violence prevention sponsored by Follen Church's Gun Violence Prevention Group and co-sponsored by Lexington Says Enough. More details here. Join us for the April meeting of our Healthcare team when we'll be talking about research needed to support the elections team for the 2018 midterms, potential actions around funding for CDC research on the health effects of gun violence, and advocacy to be done for healthcare at the state level. New members welcome. 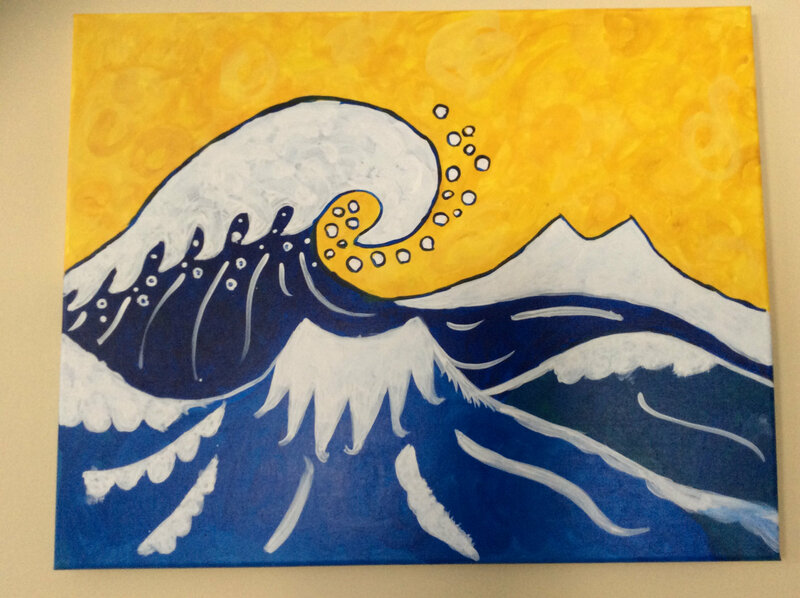 Join our Weekday Warriors team in the community room downstairs at the Fox Branch Library in Arlington where we will be writing postcards to voters and discussing how to reach our communities to debunk the myths surrounding the far right's attempt to repeal the state law protecting transgender people. Join us at our April book club meeting when we'll be discussing How Democracies Die by Steven Levitsky and Daniel Ziblatt. Use this link to RSVP, suggest books to read, or help us decide which books to discuss later this spring. New members are always welcome and there's no need to have read the book in advance - sign up using the link above and we'll provide a summary a few days before the meeting. First Parish in Lexington is presenting Paul Winter’s Missa Gaia: A Mass for the Earth in a collaboration between the First Parish sanctuary and children’s choirs, the Vermont Dance Collective and a world music ensemble of percussionists, guitar, piano, electric keyboards, soprano sax, oboe, cello and bass. Minuteman Indivisible's Climate & Environment team will have a table at the event where audience members will be able to learn about the work we're doing. See this link for more details and information on how to purchase tickets. Science Strikes Back! Celebrate science with a focus on climate change and the need for science-based policy. There will be speakers, music, and activities for all. More details and RSVP here. Join the Elections team for updates on our work in PA-06, NJ-11, and KY-06 and a discussion about which campaign(s) we should consider supporting. Do you have a favorite House race out there that you'd like to see us throw our muscle behind? Put together your 2-minute "elevator speech" in favor of that race and come to the meeting ready to pitch it! One fun way to research our choices is to use this nifty NYTimes interactive graph. We welcome new team members.